Every minute of every day, someone needs blood. That blood can only come from a volunteer donor. A person like you who makes the choice to donate. 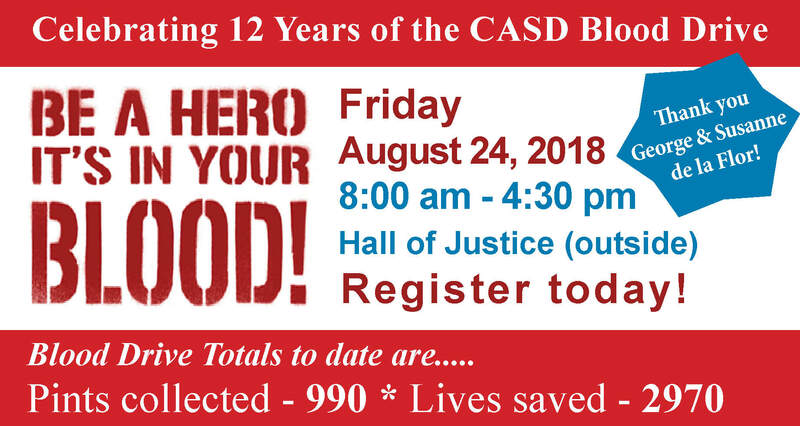 Become a hero at the CASD Blood Drive! Please contact Susanne de la Flor at (619) 203-4024 or via email at susanne@litivate.com for more information. Please eat a good meal and drink plenty of fluids before donating blood. All donors must show picture identification. This is an event put on by the efforts of Susanne de la Flor & the volunteers of CASD's Outreach Committee. For information about CASD's Outreach Committee and upcoming volunteer opportunities or to join the committee, contact Ilima Eastwood at ilima@casd.org.